In June 2006, talks concerning a territorial dispute over the Bakassi peninsula were resolved. The talks involved President Paul Biya of Cameroon, then President Olusegun Obasanjo of Nigeria and then UN Secretary General Kofi Annan, and resulted in Cameroonian control of the oil-rich peninsula. 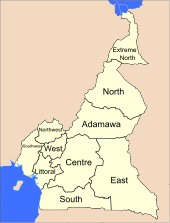 The northern portion of the territory was formally handed over to the Cameroonian government in August 2006, and the remainder of the peninsula was left to Cameroon 2 years later, in 2008. ^ a b Genin, Aaron (2019-02-11). "AFRICAN POWDER KEG: CAMEROONIAN CONFLICT AND AFRICAN SECURITY". The California Review. Retrieved 2019-04-16. 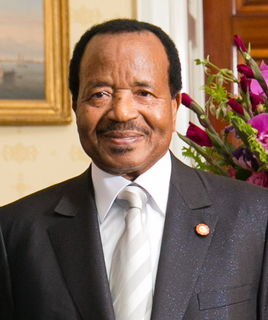 Paul Biya is a Cameroonian politician serving as the President of Cameroon since 6 November 1982. 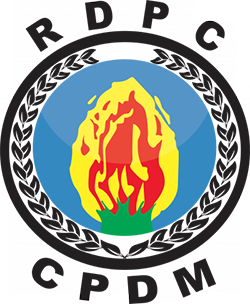 The Cameroon People's Democratic Movement is the ruling political party in Cameroon. 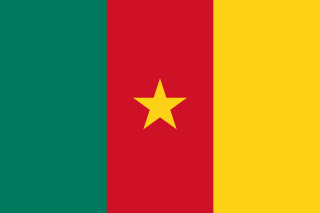 Previously known as the Cameroonian National Union, which had dominated Cameroon politics since independence in 1960, it was renamed in 1985. The National President of the CPDM is Paul Biya, the President of Cameroon, while the Secretary-General of the RDPC's Central Committee is Jean Nkuete. The Social Democratic Front is the main opposition party of Cameroon. It is led by Ni John Fru Ndi and receives significant support from the Anglophone regions of the western part of the country. Ahmadou Babatoura Ahidjo was a Cameroonian politician who was the first President of Cameroon, holding the office from 1960 until 1982. 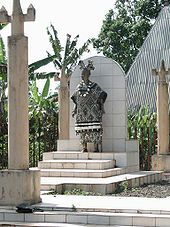 Ahidjo played a major role Cameroon's independence from France as well as reuniting the French and English-speaking parts of the country. 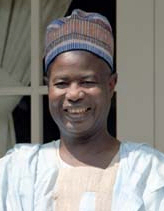 During Ahidjo's time in office, he established a centralized political system. Ahidjo established a single-party state under the Cameroon National Union in 1966. In 1972, Ahidjo abolished the federation in favor of a unitary state. Ahidjo resigned from the presidency in 1982, and Paul Biya assumed the presidency. This was an action which was surprising to Cameroonians. Accused of being behind a coup plot against Biya in 1984, Ahidjo was sentenced to death in absentia, but he died of natural causes. Philémon Yunji Yang is a Cameroonian politician who served as Prime minister from 30 June 2009 to 4 January 2019. Previously he was Assistant Secretary General of the Presidency, with the rank of minister, from 2004 to 2009. He served in the government from 1975 to 1984 and was Cameroon's Ambassador to Canada from 1984 to 2004. He is the longest-serving Prime Minister in Cameroonian history. Ni John Fru Ndi is a Cameroonian politician. He founded the Social Democratic Front (SDF), the main opposition party in Cameroon, in 1990, and he has led the party since then. Ephraïm Inoni is a Cameroonian politician who was Prime Minister of Cameroon from 2004 to 2009. He was a long-time aide of President Paul Biya and is a member of the ruling Cameroon People's Democratic Movement (RDPC). He was appointed to the position of Prime Minister by Biya on December 8, 2004 and was sworn in that day. Laurent Esso is a Cameroonian politician who has held a succession of key posts under President Paul Biya since 1988. He served in the government of Cameroon as Minister of Justice from 1996 to 2000, Minister of Public Health from 2000 to 2001, Minister of Defense from 2001 to 2004, and Minister of Foreign Affairs from 2004 to 2006. Subsequently, Esso was Secretary-General of the Presidency, with the rank of Minister of State, from September 2006 to December 2011. He has again served as Minister of Justice since December 2011. 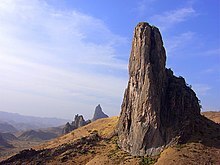 Cameroon is home to nearly 250 languages. These include 55 Afro-Asiatic languages, twoNilo-Saharan languages, four Ubangian languages, and 169 Niger–Congo languages. This latter group comprises one Senegambian language (Fulfulde), 28 Adamawa languages, and 142 Benue–Congo languages . 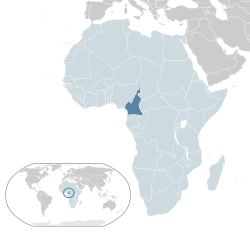 French and English are official languages, a heritage of Cameroon's colonial past as a colony of both France and the United Kingdom from 1916 to 1960. Eight out of the ten regions of Cameroon are primarily francophone, representing 83% of the country's population, and two are anglophone, representing 17%. The anglophone proportion of the country is in constant regression, having decreased from 21% in 1976 to 20% in 1987 and to 17% in 2005, and is estimated at 16% in 2015. 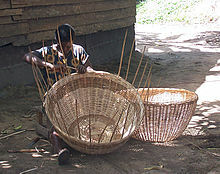 Sports in Cameroon is practiced widely by the population and advocated by the national government. 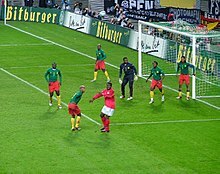 Cameroonians take pride in victories at international competitions, making sport an important source of national unity. 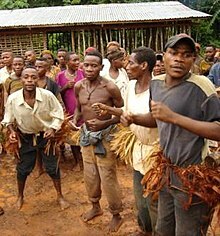 Traditional sports in Cameroon include canoe racing, swimming, tug of war, and wrestling. Wrestling has featured in the initiation rites and other ceremonies of ethnic groups such as the Bakweri and the Duala. However, in modern times, sports such as basketball, boxing, cycling, handball, netball, and table tennis have become popular. The 40 km Mount Cameroon Race of Hope draws several hundred runners each year. Tourists hike, rock climb, and mountaineer, especially up Mount Cameroon. Yaoundé, Tiko and Kribi have golf courses. Rugby union is also played, with about 15 clubs and 3000 players nationally. Edgar Alain Mebe Ngo'o is a Cameroonian politician who has occupied multiple positions in the government of Cameroon and has served in the government of Cameroon as Minister of Transport from 2015 to 2017. An important security official, he was Delegate-General for National Security from 2004 to 2009 and Minister-Delegate at the Presidency for Defense from 2009 to 2015.